iamafeeder.net » Where My Truffles At? I tweaked Ina’s recipe slightly with the inclusion of some lovely fresh wild mushrooms I found in the supermarket, as well as a little shaved summer truffle. I also lacked chives, but can imagine the flavours would work beautifully together, so you should have chives. So before we get to the recipe a couple of announcements: first off thank you all so much for the encouragement, the comments and the offers of accommodation whilst I’m on my travels! I would love to be shown around your cities by such lovely and kind people! Email me if you have any more recommendations (or drop me a comment)! Secondly, the new website is coming along beautifully, thanks to the fantastically talented (and patient) David. Seriously, he is being such a superstar about the whole thing, especially when he asks me a question about whether I want x, y or z and I haven’t got the foggiest what he’s on about and make him explain it all in painstaking detail, which he does without complaining. Patience of a saint. Thank you! Thirdly, as I should’ve mentioned a few days ago, entry for my summer-themed recipe competition is now closed, but I’ve still got two or three recipes that I’m finally getting to this week that were submitted before the deadline. I’ll announce the winner by the end of the month! 1. Bring a pot of water to the boil – add about 1 tbsp salt just as it’s reaching the boil. 2. In a small pan sautee the wild mushrooms until golden. Set aside. 3. In a large pan bring the cream to the boil, then add the truffle butter, 1 tsp salt, and 1/2 tsp pepper and lower the heat to very low. Stir to melt the butter and keep warm – you may want to thicken it up a little if it’s too runny, and to do so simply let the cream boil a little, stirring all the while. When it has reached your desired consistency add the sauteed wild mushrooms. 4. Cook the pasta until al dente. Reserve 1/2 cup of the cooking water and drain the pasta. 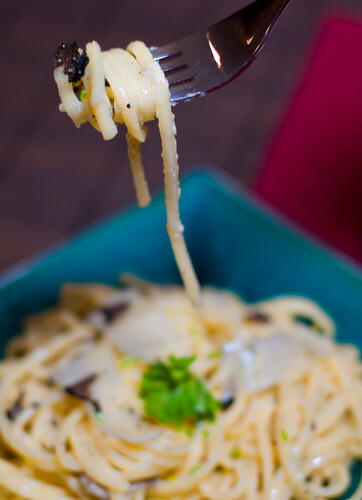 Toss the cooked pasta with the truffle-cream mixture, adding as much of the reserved cooking water as necessary to keep the pasta very creamy. 5. To serve: place in bowls, shave some parmesan and some truffle on top, season with a little salt and black pepper, and chow down. You can thank Ina later. That’s all for now, then. More very soon, so until then: peace and love. that is an incredible pasta dish! The flavor of that truffle butter with the wild mushrooms and the double cream must have been mind blowing!! wow….this is pasta taken to the next level!!! I haven't seen any truffle products in our local markets…..I think a road trip might me in order!! That looks so good I am salivating right now!!!!!!!!! Can you please have me over for dinner? This looks so so good! I wish we lived closer (we could eat together and then talk about our writing) I'm still swamped but I promise to get to that email. I am honored to know you sweet girl! 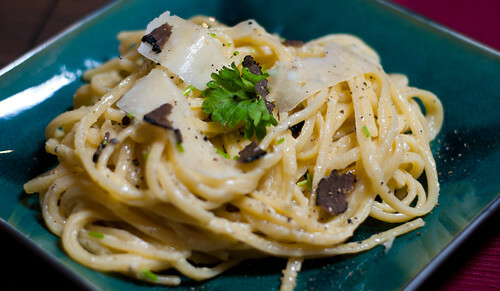 Oh man truffle, pasta and butter is heaven! this website is great for knowing whats going on in Melbourne in regards to music, art, food everything! Crown in Southbank is nice to stroll through and they have some good restaurants like Rockpool, Maze and Nobu. Hope you have an awesome time here! Holy cow, that looks AMAZING!!! This sounds so incredibly rich and decadent! I can't help but love it. And contest? How on earth did I miss that!? Dennis – I was amazed at how readily available truffles were to me! They seem to be in all the major supermarkets at the moment, and for ridiculously cheap prices! If you can do make this – it is sooo tasty. Ash – you and me both, girl. Sigh. Monet – that would be AMAZING. But sadly distance negates that wonderfulness… but not for long! I'll be on your side of the pond before too long =) Don't worry about the story – get to it whenever you have time! No rush! Brian – truffle oil is fantastic – drizzled into a salad? Ho-em-geez. Heaven. Margaret – thank you! And thanks for swinging by! Reeni – it was totally delicious =) Yeah, my contest sort of slipped under the radar a little, but I'll probably do another one, this time winter/Christmas themed? Stay tuned!